My musings about all things RPG. This is in response to DravenSwiftbow’s recent video of his Top 5 Desert Island RPGs. Dave gave a good, solid list which emphasized diversity of genre and system over depth within any one game. He picked self-contained core rulebooks (and one box set) which makes sense. He ended the video asking for people to give their own lists of whatever number or classifications in the comments. Because I’m a wordy dum-dum, I decided to write a short blog about it rather than dump a huge block of text in Dave’s comments. There are too many ways to do this I’m going to multiple lists. First, I’ll try Dave’s idea of multiple genres. I’m not a big sci-fi fan, but Warriors of the Red Planet would give me exactly what I want from that genre in one slim little volume. For horror, I’d pick the sixth edition of Call of Cthulhu because it’s in one volume (and it's the one I own) and benefits from the advancements made over several editions while still hewing closely to the original vibe. For something more exotic, Empire of the Petal Throne is perfect for its complete world that's intriguing and mysterious. (I just realized that Geoffrey McKinney’s Carcosa falls at an intersection of all three of these games.) For something to fill the D&D slot, I’ll pick the Holmes Basic box set – either the first printing with the geomorphs and the monster & treasure assortment, or the next one with B1. It may only go up to level 3, but you would be free to extrapolate the rest as you saw fit, and in terms of a ruleset that really totemically gets to the core of the D&D vibe, it’s hard to beat. I’m not really big into superhero games or cyberpunk, so I don’t really have a fifth pick. I guess I’ll choose MERP for nostalgic reasons. Another way to look at this is to pick setting books, modules, and toolkits instead of an actual game system. Once you’ve played TTRPGs for long enough, it’s easy enough to pick a core mechanic and make up your own system. Many of us can play D&D without the rulebooks by now, so perhaps the best bet would be to bring something with lots of random tables to help generate an infinite amount of adventure. The danger with just picking modules is that it’s an endless trap. Picking five modules to run forever is pretty limited, no matter how sandbox-y they are. There are about five really good megadungeons out there which would keep you busy until the end of time, but it would get a little same-y after a while. Campaign settings can be really good and open (various 2e AD&D, Dolmenwood, and Midderlands), but their specificity doesn't always give you the latitudes you might like. As far as toolkits go, books like Veins of the Earth can give you procedures to build your own campaign world, but you need to choose them wisely to give you a breadth of settings. You could choose something like the Fight On! compendium of Vol. 1-4, John’s Stater’s NOD or Hex Crawl Chronicles, or James V. West’s Black Pudding collection which are all filled with great ideas. The Judges Guild really perfected this kind of variable setting supplements with their Ready Ref Sheets, City State of the Invincible Overlord, Wilderlands of High Fantasy, Dave Arneson’s First Fantasy Campaign, and any of their early modules (Tegel Manor, Caverns of Thracia, Dark Tower, or Citadel of Fire). You could do a lot worse than just picking five things from the early JG stuff. In terms of something self-contained, any of the OSR retroclones would really do the trick. Basic Fantasy, Swords & Wizardry, Labyrinth Lord, Delving Deeper, OSRIC, DCC, Lamentations of the Flame Princess, Blueholme, and many others give you everything you need in one book. In all honesty, one of these games is all I would need. Whatever you wanted to change you could house rule into your own system and in a lot of cases the clones are easier to run than the original games because of some of their modern innovations. However, these kinds of desert island questions aren’t just about practical usefulness. It’s about inspiration too, and that doesn’t always match what’s pragmatic. Sometimes it’s about what brings you joy, even if that comes from a place of nostalgia and sentimental attachment. To speak to that, although it would be nice to have a breadth of systems or genres, in the end, I really just want to play some form of D&D. It’s my first love in this hobby and what I’d choose over anything else. 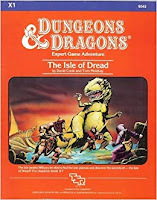 If I was going to Frankenstein a nice feel-good collection of five D&D products, I suppose I would pick the Moldvay Basic set (with B2 Keep on the Borderlands), the Cook/Marsh Expert set (with X1 Isle of Dread), the 1e AD&D Dungeon Masters Guide by Gary Gygax, the 1e AD&D Monster Manual, and the original edition’s Gods, Demi-Gods & Heroes (the original, unedited version, not the incomplete WotC resissue). Even though these five span three different editions of the game (0e, 1e, and B/X), this is D&D to me. I’m one of those people who feel all TTRPGs in some way are just house-ruled versions of the original (this drives people nuts, sorry). In that spirit, maybe the best choice of all would be the original game and its four supplements: the white box (with the 3 LBBs), Greyhawk, Blackmoor, Eldritch Wizardry, and Gods, Demi-Gods & Heroes. You can extrapolate everything from these five, and in fact, we as gamers have over the last 40-some years. What are yours? Shane Ward of 3 Toadstools Publishing posted a cool idea on MeWe and his blog about taking your favorite bestiary off the shelf, choosing 10 monsters, and designing a setting around it. I’m someone who generally feels most fantasy RPGs are overstuffed and under-curated. The idea that a fantastic realm would support the vast array of humanoids used in many campaigns (goblins, hobgoblins, kobolds, orcs, gnolls, bugbears, lizard men, etc.) in addition to the nations of mankind has always stretched my credulity. I started by selecting monsters according to various types: a semi-intelligent humanoid, an undead, an ancient fey race, a creature from classical myth, a giant/ogre/troll-type, something aerial, something to jump out of the water, something extraplanar, and some crawling thing underground. It seemed like a sensible way to begin as well as making sure you covered a broad scope of creatures. What I found was that my self-imposed taxonomy was fairly constrictive when applied to my favorite monster books. Some bestiaries lean more towards some categories than others. This classification also doesn’t necessarily address settings of uniform environmental terrain or weather. Thematically, a selection of monsters for a desert setting or an arctic setting might make more sense than some Noah’s Ark collection. Anyway, here’s my list. I chose the First Edition Field Folio as my book. 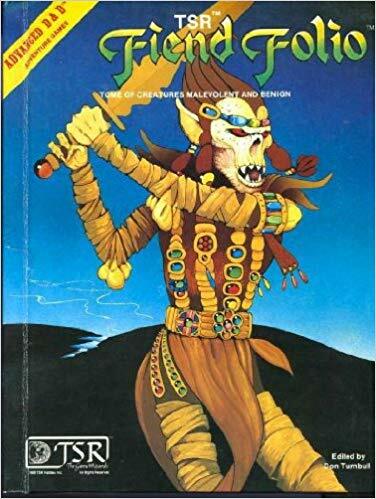 It was the first AD&D book I ever got (from Sears!) and the vibe of its artwork and oddness has had its stamp on my gaming ever since. People either love or hate this book. It has a reputation for being filled with silly frivolities no one would use in a game (like Flail Snails and Flumphs). And yet, FF contains some of the most iconic creatures/races in D&D culture: Aarakocra, Tabaxi, and Kenku – all now PC races, I believe; various monsters from the classic G-D-Q modules (Drow, Kuo-Toa, Svirfneblin, Lolth); the Lovecraftian Grell; and the classic extraplanar races of the Githyanki and Githzerai. I couldn’t quite get the list down to 10. I cheated a bit by picking two for one category (the underground critters are little), and a broad grouping of monsters for two others. I left a bunch of good ones behind, including some of the more iconic ones to help it feel more original. Still, it was hard not to include the Giant Troll and the Mountain Giant, both of which I think I like better than their more standard counterparts. I’ve put the categorical list below, but first, let’s look at the setting, a Dark Ages analogue of the lands around the Black and Caspian Seas in the West, stretching to Tibet and Myanmar in the East. Welcome to Casperovia (meh), a land of isolated city-states and falling kingdoms, separated by mountain passes and deep forests. The common folk are superstitious and hesitant to travel at night. You can hear the Doombats shrieking from their mountain cave eeries at the witching hour, ridden by evil men called Doomriders. Necromancers send out their subhuman Grimlocks from their cavernous pits to raid small villages and bring back innocent victims to defile in terrible rites. Those few who wander into the underworld may find death in lowly forms of life crawling beneath the ground, like the Volt and the Osquip. Deeper still are the Deep Gnomes, those small fey creatures who left the world of light long ago when mankind awoke, and now dig deep into the dark places singing to the rock of the secrets of old. Lower still lie ancient cities buried in a cataclysmic event, forgotten necropolises filled with Coffer Corpses haunting dead streets having died before their spirits could be put to rest. Now these guard the technological wonders of a bygone age. The surface world has its own terrors like the lonely Ettercap with his spider hoards hunting the woods spinning web palaces of sticky, dark death. The seas of Casperovia are a dangerous place for the men who sail them, as siren Kelpies lure them into their botanical embrace in the guise of beautiful water nymphs. In the cities, women and children dare not walk the streets at night for fear a Penanggalan will swoop down on them and feast on their flesh. Pregnant women are a particular favorite of the creature, with tales of traitorous midwives revealing their nature filling new mothers with dread. A new evil, the Slaadi, has entered the land through a doorway deep in the earth, hidden somewhere within the Fire Swamp. Like the Penanggalan, they can change their demonic toad shape and walk among humans as one of their own, with the threat to capture and enslave them. However, all is not lost. Some say the dragons from the East have returned after a long slumber. Perhaps these wyrms of old may put their past enmities with humans aside to banish the extraterrestrial frogs. Today's post is really just a way for me to get down in writing what I'd like to focus on in gaming for the rest of the year. My regular Basic Fantasy campaign is winding down. We were going to end it last session, but we needed to cut it short due to time, leaving the PCs halfway through Death Frost Doom. We were supposed to finish it off today, but real life got in the way. In any case, we only have one more session left which means I'll more time to try out a lot more games and put energy into other projects. First up, I'm working on polishing my notes for the city of Slateholm and submitting it to the Basic Fantasy Workshop. These were all the loose pages of scribbled notes and random tables I used for that portion of my campaign. 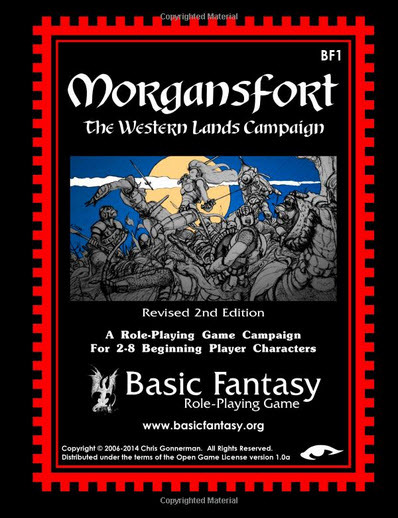 My players only touched a very small part of it for the couple of sessions they were there and I think there's enough good stuff there to be useful to someone running Morgansfort. My intent with this isn't for these notes and tables to become their own module, but more just in the spirit of sharing what I put together. Next, I've been slowly working on a draft of an adventure for Basic Fantasy. My idea is pretty large, and I'd like to playtest it before submitting it to the Workshop. At the core is a neat little dungeon idea surrounded by a mini-hex crawl. I think there's a lot of potential for it. I don't think I'll have a draft by the end of the year like I'd hoped, but if I can get the central dungeon written and tested along with the nearby town and surrounds, that will be good. I'm also chipping away at fleshing out the one-page dungeon I submitted to the One-Page Dungeon Contest last year (I was one of the many runner-up winners). I think I tried to pack too much into the one-page concept and there was a lot of vague details left for the GM to fill in. I was initially going to write this for an OD&D-type system, but tonally it doesn't quite fit (perhaps Swords & Wizardry). There's some body-horror elements that are actually more of a fit for a Lamentations of the Flame Princess or Dungeon Crawl Classics adventure. I'm less comfortable with those systems, however, so we'll see what I think once it's written. I think if I just pitch it to a Basic-style game, I'll be in the ball park, at least. 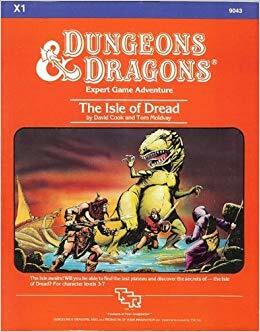 Speaking of OD&D, I have a hankering for writing a couple of small scenarios for either or both Iron Falcon and Delving Deeper. S&W is pretty well-supported with adventures, but IF and DD each have their own flavor of the early game which I think is worth supporting. All of these adventures will need to be played through too, so I plan my gaming for the next several months to be running various versions of OD&D. A side benefit to running all this 0e will be that it will help me to really figure out what I like or don't like for my own 0e system I'm putting together. I know that the last thing the RPG community needs is another OD&D clone, but it's really just a way to put my own house rules together in a format to share with players. I'll probably put it up on Lulu for free digitally and a print version at cost, but the main purpose won't be commercially-driven. I've also, strangely enough, been looking at 5e. One of my players in my local group wants to run a campaign and I'm curious to get a feel for the system that everyone is playing. I've taken a good look at the free Basic Rules, and while I think there is some good things about it, I'm not quite sold on it. There are some things that I still have hard time with. I'd like to give it a fair shake though. And because I can't leave well enough alone, I've started putting together, not just one, but two different set of hack rules for 5e based on the SRD. In other words, 5e if I had written it. It's a little bit of an experiment. How much can I take out and still stay true to the rules or the spirit of the rules. Can I make a version of the game I'd want to play, but still use the same engine to be 5e-compatible? It's my way of getting under the hood and learning the system as well. All this for 2019 and I'd still like to play a little Call of Cthulhu and Empire of the Petal Throne as well. I suppose it's better to be busy than bored. We last left our party across the street from a tenement building in a Ravenstone neighborhood where a cultist they were following had just entered. After a minute of discussion, the group stakes out in an alley while Pater crosses the road and enters the apartment building. Pater hears a voice from the door on the right. It’s a man gruffly speaking in a tone of command. The door begins to open and Pater ducks back into the shadows under the stairs. The cultist exits followed by a chain of very pregnant women. Pater dives and backstabs the cultist who falls under the lethal strike of his blade. The women, dressed in rags and bound together at the wrists, are shocked, but looked somewhat numb to the violence. Pater asks who they are. A young, dark-haired woman says they are known as The Mothers. They are slaves whose lives are dedicated to breeding slave stock. The unfortunate brother was collecting them to bring them back to the pits from their physician visit. Pater brings them outside and across the street where their bonds are cut. Pater goes back inside to hide the body inside the apartment. He gets the body back inside, but leaves quickly when he hears a voice from the back room ask, “Br. Woodward, is that you,” identifying him as the son of the widow from the night before. Two men come out of the building just as Pater makes it to the alley after having discovered Woodward. The noon bell tolls and the streets begin filling with townspeople making their way to the chapel. The group find a (for now) empty house where they hole up while they decide what to do next. The household is a middle-class home unremarkable except for the oil-painted picture of the demon lord, Shah Gzerohn, in multiple rooms. The townspeople are apparently true believers. Nyphus and Mel head to the chapel while Pater and Renic head northeast towards the industrial warehouse section of town. They find an abandoned storeroom on the edge of town. Pater leaves Renic in charge of the Mothers while he leaves to watch the chapel. He meets two men on the street on his way there. Renic leaves the Mothers alone to keep from being left on guard duty. Nyphus and Mel make their way in to the chapel from near back of a long line. The middle of the chapel contains a giant green crystal coming up from the floor. Both make their way downstairs to the sacristy where a line of worshippers are entering a portal through the crystal. Nyphus enters the portal, Mel does not until later under pressure from the evil brotherhood after she tries to make her way down into the slave pits. They find themselves in front of a giant stronghold on an enormous cloud bank over Ravenstone. They are given an audience with Archbishop Nemesine in a throne room full of Ravenstone worshippers/townspeople. In the gallery leading to the throne room are large oil works depicting brutal scenes of worship of Shah Gzerohn as well as Nemesine’s personal history. At the end are recent works of the party themselves, saving the early barbarian tribe from the mural in the dungeon of the Island Fortress. Nemesine is a Sidhe, a faerie being from another world. He and his lover are exiles from their home world and were cursed by clerics of Tah shortly after their arrival in this one. He cannot walk the earth in his true form and may not leave this one for another. Here on the cloud demi-plane he at least may cover his hideous new form, a mass of writhing maggots. His lover, similarly disfigured, committed suicide. Nemesine fails to Geas both Nyphus and Mel. Instead he offers them a deal. He seeks the Miter of Tah which was stolen by the Duvan’Ku, the original worshippers of Shah Gzerohn before the barbarians. The cult was vanquished 700 years ago in their last shrine in the Demonfrost Mountains on a peak called Deathfrost by a group of Tah’s disciples attempting to take back the magical Miter. The clerics never returned, but the cult was also never seen again. It is said Deathfrost’s shrine is filled with gold and ancient artifacts of wonder. Nemesine’s acolytes cannot climb the peak. Their green marks begin to burn and their minds fray approaching the peak. The Miter will let Nemesine remove his curse and leave this plane for good. If the party returns with the item, Nemesine vows to let the freed Mothers go, disband the Green Mark, put an end to the slave pits of Ravenstone, and leave this plane. Mel draws up a contract between them, sealed with the mark of Persephone and Demeter. In the meantime, Renic leaves the Mothers in their warehouse hideout for the chapel. Pater sees him approach from his hiding place. Renic quickly escalates into a conflict with the acolytes and chops one in two. The fight flushes out Pater as well. They are pursued by cultists, eventually lose them, and meet back at the warehouse. Nyphus and Mel return later with the terms of their agreement, planning to return back to the chapel the next morning. I’ve been formulating an idea of a particular type of dungeon room with which I’ve recently become enamored. For lack of a better term I’ll call them dungeon digressions. These rooms are not only set apart from the general theme of everything else going on around them, but more importantly hint at a larger “otherness” beyond the understood edges of the adventure, or even campaign. I’ll give you an example which crystalized this concept for me when I recently re-read G1 Steading of the Hill Giant Chief. The room is 17A of the dungeon level, the Weird Abandoned Temple. The orcs on this level (presumably those rebelling against their giant masters) have blocked the door to this temple with rocks, and it is bolted shut. Whether it’s an attempt to keep people out or keep something else in is precisely what makes it so inviting for curious adventurers. Inside the temple the stonework glows purplish-green. The walls chill to the touch and the columns induce nausea. Carved signs and shapes seem to stare at intruders and shift position when not watched. A greasy, yellow-gray altar sits at the far end and beyond it a concave alcove. Staring into the alcove causes visions of sickly mauve and violet tendrils to writhe and stretch towards the viewer, causing insanity 50% of the time. If the viewer doesn’t go insane, they are gifted a scarab of insanity or a 5,000 g.p. gem. This is a great eerie room heavy on the eldritch vibe, but it’s the room’s context within the rest of the adventure that makes it stand out. This room shows up in the middle of a 9th-level recon/hack-and-slash stronghold invasion with enslaved orcs revolting against giants working for the Drow. There’s a lot going on in this module already, with breadcrumbs, subplots, and portals to the next chain of adventurers in the G-D-Q series. So why did Gary stick 17A (and 18, the blocked-off Vestry sloping downward) into this adventure? Was it a hint or a connection to a cult of evil chaos, or elemental evil? Or does the vision of the alcove with its Lovecraftian feel hint at a Tharizdun connection? Whatever the intention, the impact is great. No matter how massive and intricate Lolth’s grand designs are in this campaign, this one little room gives a hint of a massive, incomprehensible reality which dwarfs the demonweb queen’s machinations making them seem petty and small by comparison. It’s a small portal, a tiny digression, which drops off a deep end into a larger, abyssal perspective. I love it. Michael Curtis’ Cenotaph room in the canyon of Stonehell is a very brief version of this with the room’s bas relief intimating the knowledge of a vast sleeping entity lying in wait in a distant land. With that kind of realization, what does it matter if you are downed by a pack of filthy kobolds in some forgotten corner of an underground prison complex. The scale of the PCs’ mortal lives have no meaning by comparison. It does a lot without really doing very much of anything, preparing the PCs for the discovery of the nixthisis at the heart of the underground hell. The main interest for me with these side-rooms isn’t that they bring a whiff of R’lyeh to the game. The eldritch quality of both is merely coincidental. What’s great about them is they offer a door to worlds older than the mountains in their current dimension. In short, they can be a hook or way out of the current adventure into something deeper and weirder. If they want it, that is. In the case of G1’s 17A, the PCs can decide that what lay beyond the bronze-banded door was interesting enough to abandon Geoff, clear out the rumble in the Vestry, and find their way down to the veins of the earth, so to speak. One more example I recently came across is in the Basic Fantasy adventure, “House of Coldarius,” from BF3 Strongholds of Sorcery. The adventure largely concerns a vampire kidnapping a wizard pupil to create a dark, intelligent sword. It’s a fun, beat-the-clock rescue in a scary house with various Universal movie monster stand-ins (there’s a vampire, a flesh golem, a mummy, a lycanthrope, etc.). However, in the locked parlor of room 39 on level 7, there’s a black metal arch with silver runes that serves as a gateway to the world of the Moonmist Moor, a Bronze Age realm haunted by spectres who feed off the few humans at night and are kept at bay by huge monoliths called Spires. It’s only a thumbnail sketch of a world, but the strange open possibilities of it, the offer to the party to go “elsewhere” is everything that fantasy should be about. These kinds of side-door encounters aren’t exclusive to D&D. They can be found all over the fantasy genre. “Riddles in the Dark,” from The Hobbit, is maybe the most famous example. Bilbo gets separated from his party, meets a weird creature, finds a magic ring, and the fate of all Middle Earth changes. Without that digression and resulting alternate way out (literally), you don’t get The Lord of the Rings. A lot of times the campaigns we create are built around a central, preconceived narrative idea that everything rests on. But these little “dungeon digressions” are important to have in the game as release valves or rifts to other worlds or adventures to keep things unexpected and fresh. What might start as a typical dungeon delve turns into doorway to Barsoom. The heist of a rare piece of art becomes a portal to the Blue Medusa’s maze. A mirror becomes a way into Voivodja. An escape from the city watch through a garden gate leads to a trek into Ynn. A passage through Ultan’s door takes you to the dream world of Zyan, with its masks and puppet masters. Basically, don’t be afraid to Terry-Gilliam your D&D game. After Nyphus lays down a challenge to the black-cloaked cultists, he starts to cross the street towards them when he hears the whistle of the city guard. He stops in his tracks and waits for the guard to reach him. At the same time, the cultists also begin walking toward Nyphus. The parade, and attending onlookers, remain watchful to see how the drama plays out. Pater, Mel, and Renic blend in to the crowd and watch to see what happens to Nyphus. The guards approach Nyphus and the cultists and demand to know what’s going on. Nyphus accuses the cultists of evil acts at Morgansfort, and the cultists expose Nyphus and his party as the wanted murderers of members of their order. Things become heated when Jochim, led by the boy from his office the day before, suddenly steps in and advocates on Nyphus’ behalf. With the duties master involved, the guards decide this squabble is above their pay grade and announce that they will bring both parties before the Duke to settle the matter. A march to the palace follows with guards between the cultist and Nyphus, Jochim, and the boy. Pater, Mel, and Renic all follow separately at a distance. As the group moves into the merchant quarter on the way to the Noble quarter a carriage with the initials, MR, passes them, seemingly on its to the palace too. The procession enters the palace gates, but the rest wait outside before deciding to regroup back at the ship. Upon entering the throne room, the Duke is seen finishing up some business with a group of elegantly garbed elvish diplomats from Avenrho. It is their ship docked at the wharf next to the Amber Tide and the Tarred Goose. The Duke tiredly asks the guard what this is about. After a brief synopsis of the situation, Nyphus lays out his case passionately. The cultists lay out theirs. During their testimonies two people enter on the side of the throne room, an elderly gentleman in a wheel chair and his much-younger caretaker, a raven-haired woman with cruel eyes. This is Baron Morgan Rathwynn, father of Halden. He recounts the accusations of murder delivered to him by the Bailiff and Father Thelbain. The boy, Caleb, tells Jochim he saw the Baron’s caretaker with a green mark tattoo on her chest while she was undressed. The Duke, not wanting to get involved in a religious dispute, takes each party into his private quarters for an interview. He meets with Nyphus and Jochim last. He tells Nyphus to slip away as early as he can the following morning once the ships are allowed to disembark. The group go back to the Goose and ask them to leave as early as possible. They gather their stuff from the wagon. They give Jochim the wagon for his trouble. Nyphus thanks the boy and they all leave early the next day. The party and the ship’s crew get on well. Much drunken cavorting occurs. On the third night of what is to be a two -week voyage, Nyphus has a dream. He finds himself in a long stone hallway. At the end are two fountains. An eerie music plays. To the left is a milky fog of star lights, beyond which is an altar. On the altar, beside two golden goblets and a large book is a miter. Nyphus wakes with a start. The boat rocks restlessly and the crew can be heard up on deck. Nyphus goes on deck as does the rest of the party. Four large Rocs are circling overhead, but do not attack. The crew are alarmed by the great creatures’ passivity and spooked by the strange omen. The next day they Ravenstone is sighted off the starboard bow – a week and a half early. The Goose’s crew quietly unload their cargo and take off, glad to rid of the strange southerners. The party find accommodations at a tavern/inn near the docks. Mel offers blessings to the fellow clientele in an attempt to strike up conversation and learn any news about town. She meets a middle-aged woman named Mrs. Harrelson, a widow who is proud of her son, a recent acolyte to the Green Mark, Brother Woodward. The widow talks of the cult in an adoring voice, awed that her son was part of such a holy group, reiterating the phrase, “The Green Mark will open the hearts of men.” She mentions that she hasn’t been able to see much of her son since his vows. Mel offers to dictate a letter to him and deliver it on her behalf. The widow graciously accepts and pays Mel for the service. There is a casual reference to slave pit, but beyond nothing seems too out of the ordinary. The next day, the group heads out in the direction of the chapel of the Green Mark which is said to be at the heart of town, all roads leading to it. The morning streets are gloomy, due to the bank of clouds that hang over the city. The weather is brisk, but not yet cold, due to the humidity. No one appears on the streets which, although clean, are packed with ugly, three-story, shingle-sided tenements. They reach the chapel, a small, squat and windowless building on its own at the center of a five-pointed intersection. Before approaching, they see a cultist leave the building and furtively move down the street opposite. The group decide to follow him, stopping when he enters a tenement. They wait and decide what to do next. I’ve been thinking a lot about the ability score modifiers throughout the various editions of D&D lately (actually the past year), and how these differences affect the game. Turning them over in my mind, I hit upon a revelation as it related to primary differences between the modifiers in 0e, Holmes*, 1e, and 2e and those in B/X and BECMI. The modifiers are not only the primary drivers for how these two different platforms of D&D work, but they are the reason why mixing the mechanics between the Basic and Advanced rules can create a broken game. Before I dive into an analysis of the modifiers themselves and why I think the Basic-AD&D hybrid is such a volatile combination, let me first give a little contextual autobiography. This is something I think I’ve covered in a past post, but it’s worth repeating here since it’s relevant. I started playing Mentzer Basic (Red Box) in about ’84 or ’85. My friends and I played “Basic” for a year or two before bowing to the older kids’ wisdom that “Basic (was) for babies” and moved to AD&D. 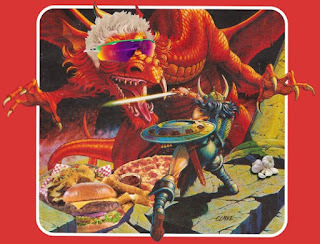 When I say we played AD&D, I mean we borrowed what we liked from the Advanced game and used it in our Basic campaign. AD&D tournament-legal, we were not. 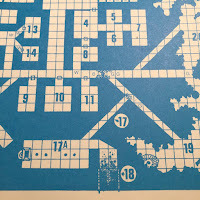 At the time I felt guilty and conflicted about it, like we were cheating, not playing by the actual rules because AD&D had more rules than I cared to keep track of. It was (and still is) hard to run AD&D by the book. 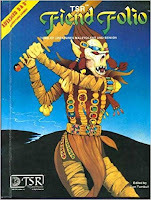 When I came back to the hobby after twenty-some years (I stopped as 2e began taking over), I found the OSR and was surprised to learn that a lot of people played the game the way I did back then, mixing Basic and AD&D. In fact, I heard a perfect description of it in one of Matt Finch’s interviews with Greg Gillespie (creator of Barrowmaze). Greg described his early gaming (at 5:30, here) as using the engine of Basic and Advanced as the chrome. That’s exactly it. We used a lot of the core rules from the Basic game (ability mods, combat mechanics, etc.) and the character options (more races, more classes, no race-as-class), spells, monsters, modules, and magic items taken from Advanced. We took the cool stuff and left everything that bogged the game down (weapon speed factors, spell segments, damage-by-size, etc.). To extend Greg’s metaphor we created a hot rod of a game. It ran fast and powerful, exciting and flashy. It also eventually overheated and blew up. What I mean by that is our game became incredibly imbalanced, particularly when our PCs started reaching higher levels. D&D has always had a problem with balanced high-level play, but we felt the effects far earlier and I think with some perspective I understand why. Both the Basic and the Advanced games were built to be balanced within their own rule sets and were not intended to be mixed. That balance begins, and in some ways largely rests, on how each game’s ability score modifiers fit with the rest of the rules. In my case, I’m talking about using Basic’s ability score modifiers with AD&D’s more powerful character options. For those who haven’t played any early D&D, the ability modifiers break down thusly. OD&D, Holmes, and AD&D have ability modifiers that are really flat by today’s standards. The modifiers are not standard across the abilities and in some cases, even the extreme ends of the 3-18 range only give a -1 or +1. Some abilities don’t necessarily give a modifier at all. There is a real appeal to these more tempered modifiers for me. A “5” in Dexterity only affects your AC by 1, not 2. A “7” in Strength doesn’t hurt your melee to-hit roll at all. Even a Constitution of “3” only takes 1 off your hit die roll. On the other hand, the bonuses are likewise more mellow and oftentimes the difference between a “15” and an “18” doesn’t seem to have as much mechanical separation as I would normally expect. By contrast, the Moldvay/Cook/Marsh B/X rules from 1981 and the following Mentzer BECMI rules have a much different approach to the ability modifiers. The modifiers are almost nearly universally applied the same way across all the abilities with the following scores: 3 (-3), 4-5 (-2), 6-8 (-1), 9-12 (+0), 13-15 (+1), 16-17 (+2), and 18 (+3). These aren’t as dramatic as the d20-era or current 5e modifiers, but this array creates a nice, dynamic bell curve where the widest range is an average non-mod, and each deviation from that average range gets progressively smaller. There’s an elegant, standardized symmetry to it. It’s also very swingy. There’s a real difference between a “15” and an “18” here that feels powerful, and at the same time, a “5” Dex or “3” Con are really damaging. Here’s where it’s helpful to look at how each of these sets of modifiers fit within their respective rule sets, which makes it clear how combining some of the AD&D mechanics with the Basic modifiers can imbalance the game. 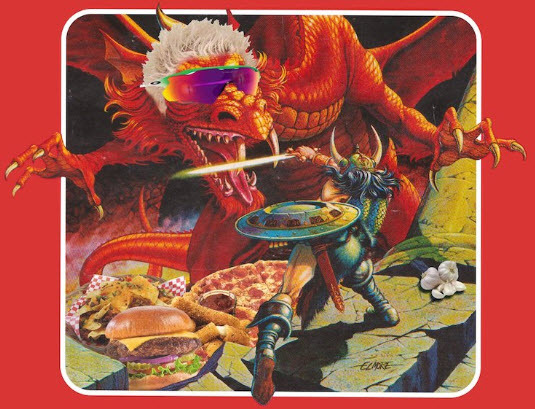 AD&D’s standard classes are little better than their Basic counterparts (Clerics get d8 hp and spells at first level, Fighters get d10 hp with faster attack progression, Thieves get better skill percentages and d6 hp, Magic-Users get more, and higher-level spells), not to mention the specialty classes (Paladin, Ranger, Druid, etc. ), each of which have special powers. These extra goodies complement the lower impact ability modifiers. The smaller modifiers keep things relatively sane when the first magic items start showing up in the campaign. Magic items, it should be said, were expected to be rewarded somewhat early in both Basic and AD&D games, in part to help with characters’ survival. A +1 long sword in the hands of an AD&D Fighter with an “18/49” Strength means a composite +2 to-hit and +4 to damage. The same +1 sword in the hands of Basic Fighter with an “18” Strength means a +4 to-hit and a +4 to damage. This extra +2 to-hit is a big difference, and it’s due to Basic’s souped-up ability mods. The Basic game didn’t have as many bells and whistles as the Advanced game, but those ability mods picked up the slack by being really dynamic, and potentially very powerful. When stacked with the extra AD&D class benefits and hit die, it could make for some supercharged PCs. Another dangerous crossover between rules was using the Method I of rolling for ability scores from AD&D with the Basic ability mods. Method I is the popular “roll 4d6, drop the lowest” method which is designed to make sure every PC has at least two scores of “15” or higher (which remember, in AD&D, have smaller modifiers). The AD&D PHB even says that it’s essential to the character’s chances of survival. Using this method in a Basic game increases the likelihood of not only 15s, but 16-18s, giving you a huge boost. It also makes the Basic rules’ more-punitive negative modifiers less likely. Along with higher mods, the higher levels of spells in the Advanced game (7th level for Clerics, 9th for Magic-Users) means real firepower enters the campaign. AD&D mechanics may seem wonky by modern sensibilities. There isn’t a standardized core mechanic. In fact, there are a number of different systems for determining success or failure (d20 attacks, % Thief skills, d6 open doors/listen checks, etc.). But when all the rules are used in conjunction together, it fits together perfectly and ticks like Swiss clockwork. It just takes time, dedication, and practice to become fluent in the 1e rules (at least that’s what die-hard 1e grognards claim). Tom Moldvay’s game is likewise very well-balanced, but it’s more streamlined and elegant. It isn’t built to simulate reality in the same way Gary’s rules seemed to try to do. Tom’s modifiers (I actually don’t know if he came up with them, but his rules mark their first appearance I’m aware of) are a big part of how that game runs. They drive a lot of the way things work. You may ask what the point of all this is. Am I just trying to validate my guilt for hot rodding the games I played as a kid? I guess the reason I’ve been thinking about this so much is two-fold. First, it makes me realize part of my reticence to try 5e lies in the fact that it appears to be an even more exaggerated example of my Basic-AD&D hybrid. The crunch of the d20 rules may have been reduced, but the even more dramatic ability score modifiers combined with even more class and race options, abilities, feats, skills, and proficiency points all indicates a game that falls into all the same hot rod traps I found as a kid. 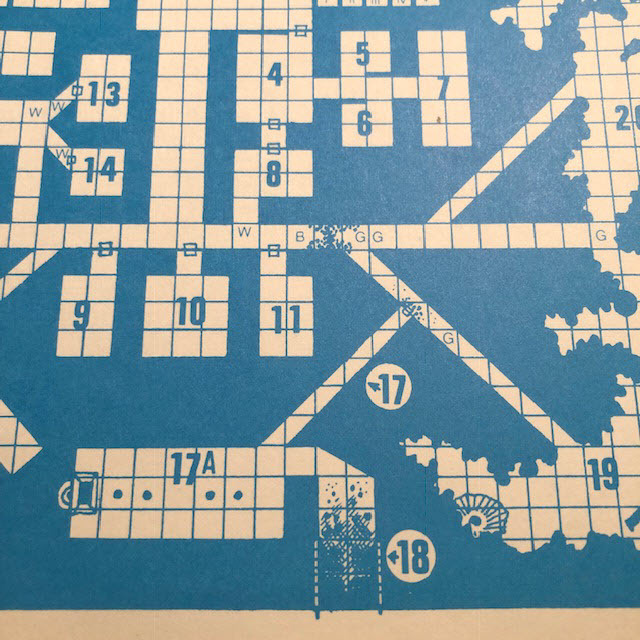 Second, my musings are in response to a lot of people, both young and old, getting into the OSR versions of the older games and talking about bringing in Advanced options into the Basic game. We often talk in the OSR about cross-compatibility between any of the early versions, and while that may be true to a large extent for running adventures (usually it’s just adjusting armor class a bit), it gets a bit trickier when it comes to combining rules mechanics around characters. Goblinoid Games just put out their combined Advanced Labyrinth Lord set of rules which is being marketed as “advanced first edition as you remember it,” the distinction being not as first edition was, but as we all played it, stripped of the fussy rules no one likes. Now, I don’t own the new book, but I do have the physical copy of the regular rules as well as the previous no-art PDF of the Advanced Edition Companion supplement. Daniel Proctor wrote a good game and is careful to mention caveats, like giving higher hit die might affect the game if used. It’s presented as rules you could use ala carte or as a whole. I just wonder how the hybrid actually operates in play, especially at higher levels. I’m not implying that a Basic-Advanced hybrid can’t be done, but I think it would need to be carefully done. I currently run Basic Fantasy which is a slightly modernized version of the old Basic game. It’s well-balanced and runs exactly how I expect it to. The Moldvay modifiers are present, but a few rule changes have been made to give the Basic system a little Advanced boost. Race-as-class is gone, as are demi-human level-limits. Thief skills are closer to the better 1e percentages and to-hit advancement is a little more aggressive. And yet, hit dice are kept relatively low, Clerics don’t get spells at first level, and the magic is kept within reason. 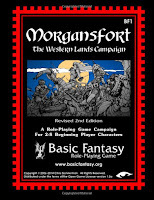 However, I constantly see people on BFRPG forums and Facebook groups who are looking for creator Chris Gonnerman to formally publish some of the supplemental classes and rules from the game’s download page which have a more Advanced flavor (paladins, rangers, druids, weapon proficiency rules, skills, higher level spells from his Iron Falcon, etc.). A lot of these supplements are pretty good (I have a paladin in my current campaign), but Chris’ refusal to add them to the core game makes me happy. He’s willing to let people explore and share options for his game through the OGL, but not willing to canonize these options as core rules themselves. Anyone’s free to hot rod their own games, but at their own peril. I don’t mean this to be a bad-wrong-fun rant or suggest that the way some people like to play isn’t correct. It’s more of an observation about my own adult preferences and making peace with the mistakes of my youth. It’s also me trying to determine how I approach my games in the future. I still haven’t fully satisfied my curiosity with ability score modifiers. I like the Moldvay modifiers, in part because I grew up using them, but also because of their clean, standardized, logical symmetry. Their larger range makes a character’s abilities more dramatic and mechanically meaningful. Although I have found that low scores in Strength, Constitution, and particularly Dexterity can cripple a PC. The Thief in my current game has a “5” Constitution (-2) which means he has to roll a “4” in order to add more than one hit point when he levels up. I like the idea of shallower OD&D modifiers in something like Iron Falcon or Swords & Wizardry, but without the AD&D extra hit points and abilities they almost seem to necessitate a campaign which includes at least a moderate amount of magic items (something I’m stingy with, as a low-fantasy GM). I did see one 0e option recently that appeals to me. Jimm Johnson from The Contemptible Cube of Quazar blog has his own house rules posted for his Planet Eris campaign. HIs universal modifier array is: 3 (-2), 4-6 (-1), 7-14 (0), 15-17 (+1), and 18 (+2). I like these a lot. The bonuses/penalties are flatter than Moldvay’s, but there’s still symmetry with a dynamic flare at the extremes. It strikes me as a nice compromise. I’d like to try some flatter modifiers out soon. It would be interesting to not rely on ability mods as much as I’m used to. No matter what I decide to go with in the future, I’ll probably still have a hard time leaving well enough alone. Old hot rodders die hard. * Yes, I know the Holmes set of rules is actually the first Basic rules set, but as far as the ability mods go, I believe they’re the same as the 3LBBs. Greyhawk Dexterity Modifier to Armor Class: Just for the Fighting Man? This is slow criticism. Those who lack the patience for deep and careful consideration may do well to go elsewhere. This blog is about context and connecting dots by drawing lines. I'm hyper-verbose and don't make any point quickly. You have been warned.